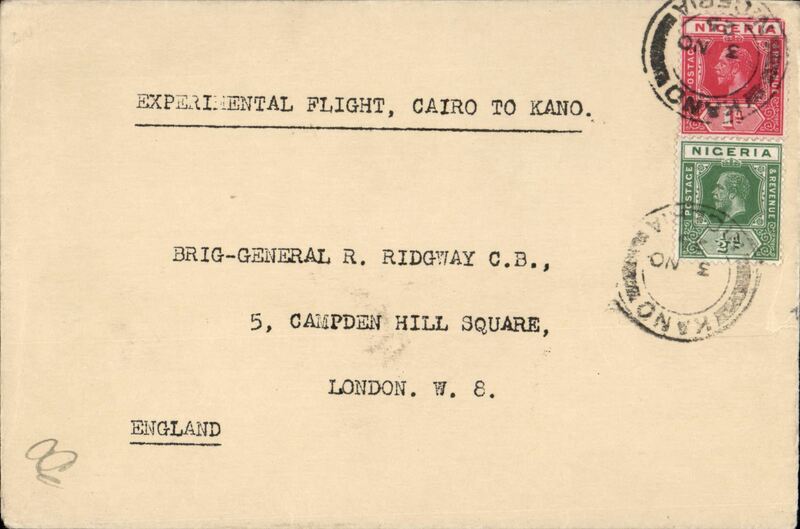 RAF Experimental flight, Cairo to Kano, POA Nov 3rd, Kano dr. cds, and bearing ordinary Nigeria 1d and 1/2d stamps, no special cancellation or cachet used but initiallled AC (Squadron Leader, later Air Marshall, Arthur Coningham) in bottom lh corner, plain cover addressed to Brig. General R. Ridgeway, C.B. Francis Field authentication hs verso. Scarce item. 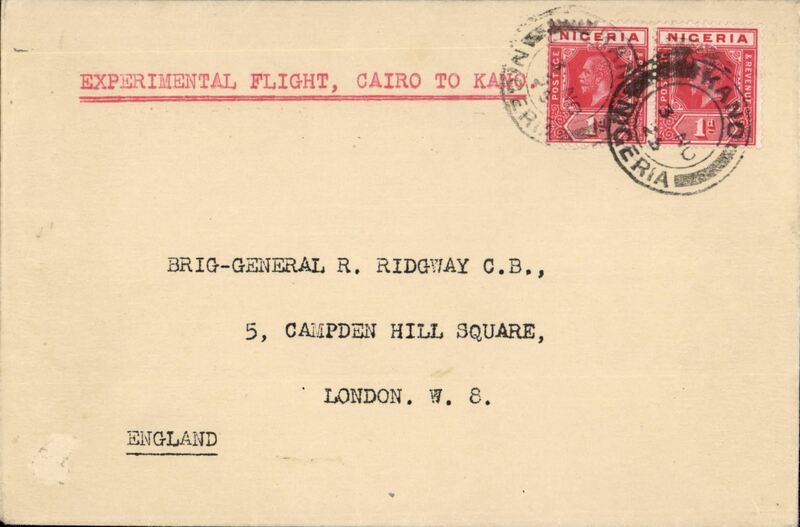 RAF Experimental flight, Cairo to Kano, POA Nov 3rd, Kano dr. cds, plain cover addressed to Brig. General R. Ridgeway, C.B. and bearing ordinary Nigeria 1d and 1/2d stamps. No special cancellations or cachets were used but Squadron Leader, later Air Marshall, Arthur Coningham, put his initials 'AC' in bottom lh corner. Unfortunately a previous owner has tried to erase these on in this particular cover and only barely visible remnants remain. This notwithstanding it is a scarce item and bears a Francis Field authentication hs verso. Aeromaritime/Lignes Aerienne Latecoere, trial acceleration of the Toulouse-Dakar service to link with inland French territories, return of the first experimental flight Niamey to Dakar, bs10/1/1926, black five line "Premier Voyage/d'essai/de laison postale rapide/Ch. de fer-Avion-Auto/Dakar Zinder", large red 'Par Avion' hs, plain cover franked Niger 30c. Carried 650 miles from Niamey to Bamako by air, then 769 miles Bamako-Dakar by rail. This was the first of three trial runs before further attempts were discontinued 1/3/26. First Austria acceptance for Niger, Vienna to Niamey, 25/2 arrival ds front and back, plain card carried on the first regular SABENA flight by the aircraft "Edmond Thieffrey" from Brussels to Leopoldville via Marseilles-Oran-Colomb Bechar-Reggan-Gao-Niamey-Zinder-Fort Lamy-Bangui-Coquilhatville, franked Austria 1925 air 10g & 25g, red framed bilingual French/Flemish F/F cachet. Kohl 35.101 A4, only 22 flown. A superb item in fine condition. Ex Clowes. First Through Airmail from Nigeria to Kenya, Makurdi in Nigeria to to Kakamega in Kenya, via First West Africa Feeder service from Kano to Khartoum, then IAW Cape Town-England service to Kisumu, then Wilson Airways Kisumu-Nairobi feeder service, plain etiquette air cover, franked 10d, backstamped Makurdi 11/2, Khartoum 18/2 , Kisumu 20/2 and Kakamega 21/2, typed " First Flight/Nigeria-Kenya". 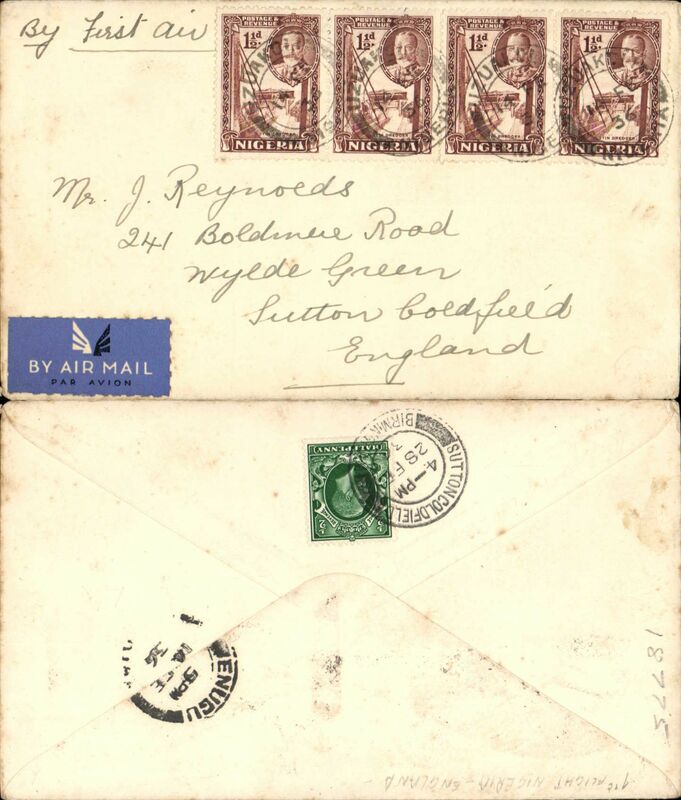 One of only three covers known to have been flown to Kenya. A rare item, see Priddy, 'West African Airmails', p19. 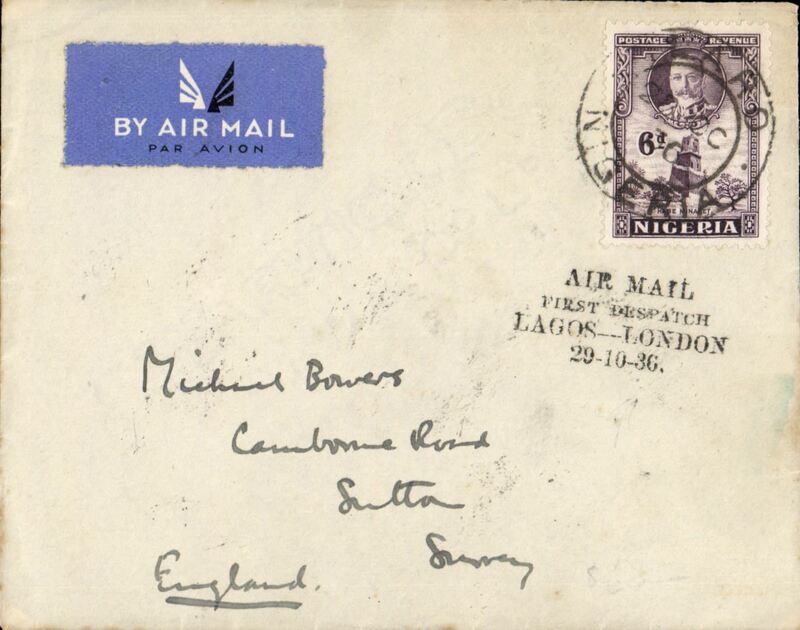 First official airmail England to Nigeria, Maidugari to Kano, bs 15/2, airmail etiquette cover franked 2d, Imperial Airways, scarce leg. 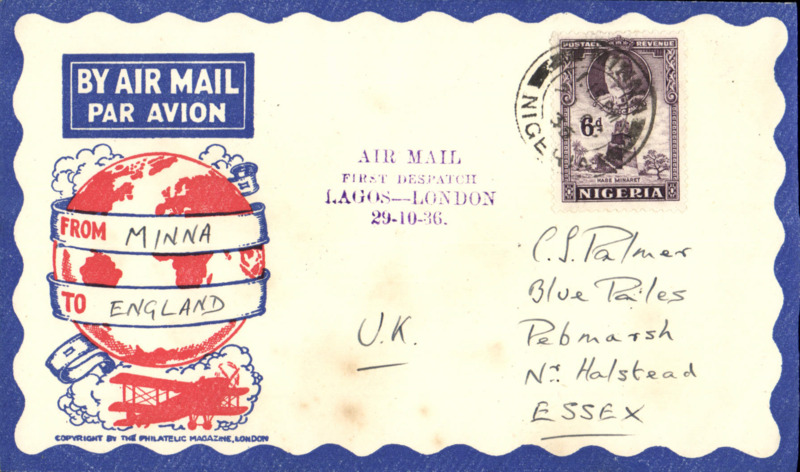 First official airmail England to Nigeria, Kano to Maidugari, bs 17/2, airmail etiquette cover franked 2d, Imperial Airways, scarce leg. 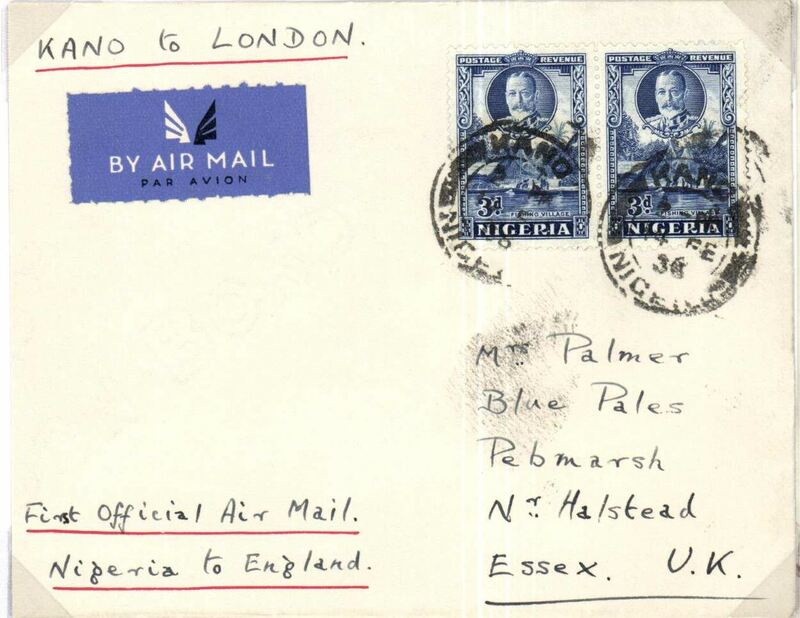 First airmail service outside Nigeria, Uzuako to London, bs SuttonColdfield 28/2, via Enugu 14/2, plain cover franked 6d, ms 'By First Air', airmail etiquette. Carried by train to Kano to join the inaugural flight of Imperial Airways's Kano-Khartoum feeder service, then on to London by flight AN317 Imperial AW Africa service. Uncommon origin, great routing, nice item. 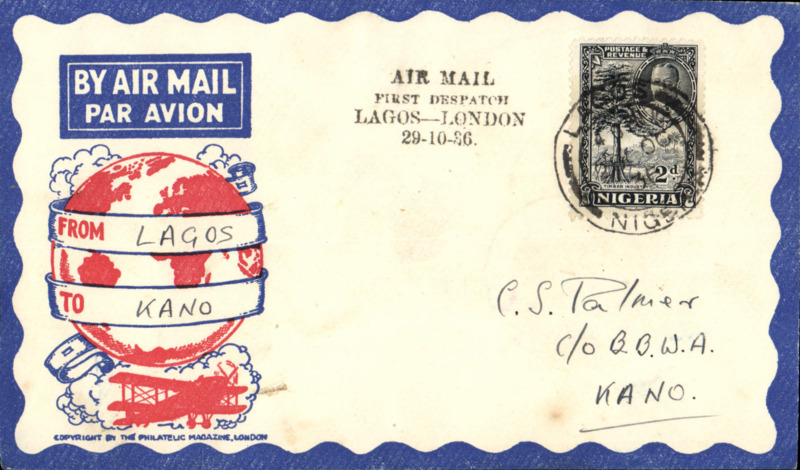 Imperial Airways, first airmail service outside Nigeria, Lagos to London, bs Wilton Road/25 Feb/36 cds, printed souvenir airmail cover, franked 6d, carried by train to Kano to join the inaugural flight of the Kano-London service. This cover is ex McCaig #754 and is illustrated in West African Airmails, The McCaig and Porter Collections, Priddy, B., West Africa Study Circle, 2002, p73. 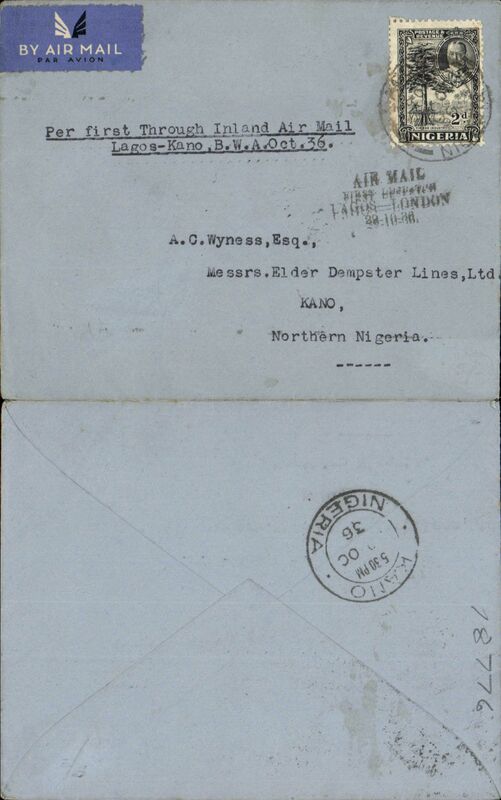 First Direct Airmail to South Africa via First West Africa Feeder service from Kano to Khartoum, air cover, franked 1/1d, posted Kano, 15/2 to Cape Town, House of Parliament 24/2 bs, via Khartoum 18/2, typed 'First Direct Airmail Nigeria to South Africa via Khartoum', pale grey imprint etiquette official envelope with transparent lower left section depicting aircraft addressed to LA Wyndham at the House of Assembly, Cape Town. Carried on two linked Imperial Airways flights WAN2 and AS 318, see Wingent. Rare test letter. 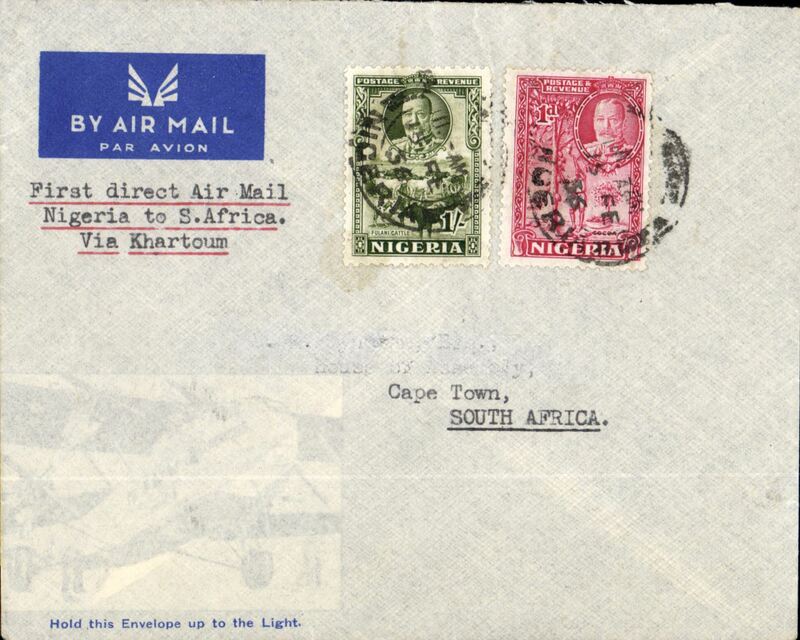 First Direct Airmail to South Africa via First West Africa Feeder service from Kano to Khartoum, air cover, franked 1/1d, posted Kano, 15/2, to Cape Town, House of Parliament 24/2 bs, via Khartoum 18/2, typed 'First Direct Airmail Nigeria to South Africa via Khartoum', pale grey imprint etiquette official envelope with transparent lower left section depicting aircraft. Carried on two linked Imperial Airways flights WAN2 and AS 318, see Wingent. Rare test letter. Francis Field authentication hs verso. 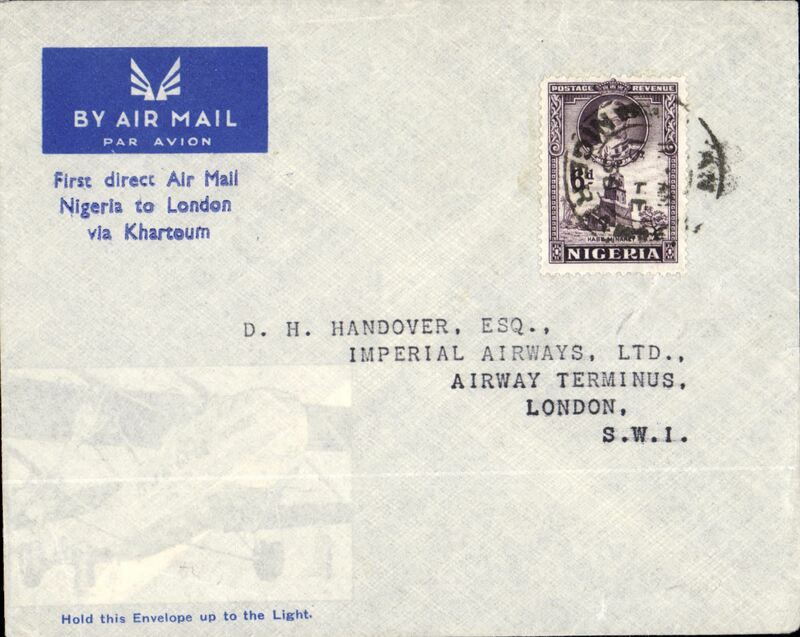 First airmail service outside Nigeria, Maiduguri to London, Sutton Coldfield 26/2 arrival ds on front, plain etiquette cover, franked 1 1/2d, ms "First Flight/Maiduguri-Khartoum-London", carried on F/F Elders Colonial AW/Imperial AW. Francis Field authentication hs verso. Only small mail from Miaduguri, see also Priddy, p18. 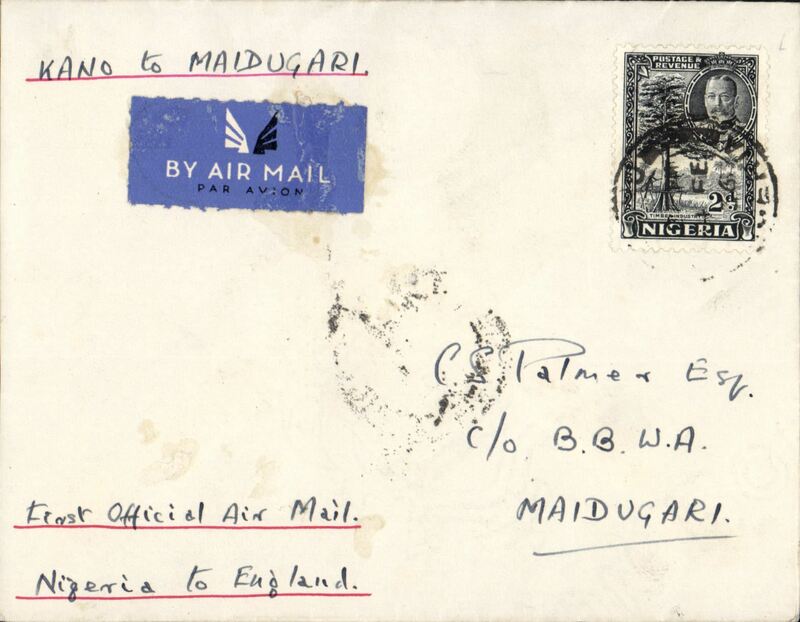 First airmail service outside Nigeria, Maiduguri to London, plain etiquette cover, correctly rated 2d, ms "Maiduguri to Kano, bs 16/2, First Official Air Mail/England to Nigeria", carried on F/F Elders Colonial AW/Imperial AW. Only small mail from Miaduguri, see also Priddy, p18. 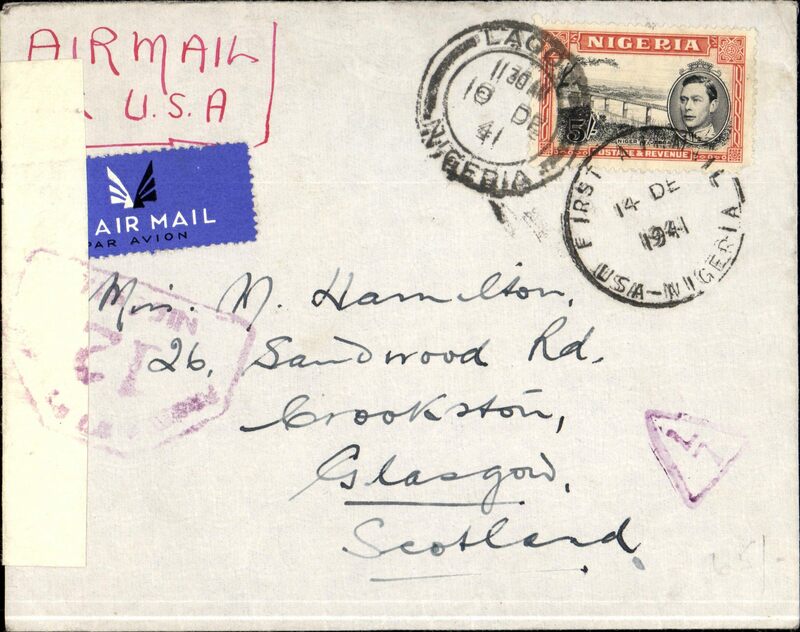 West African Feeder Service, Kano to London, no b/s, pale grey/blue imprint etiquette souvenir cover printed "First direct Air Mail to London/ via Khartoum" with transparent lower left section depicting aircraft., Imperial AW. Looks like a test letter. 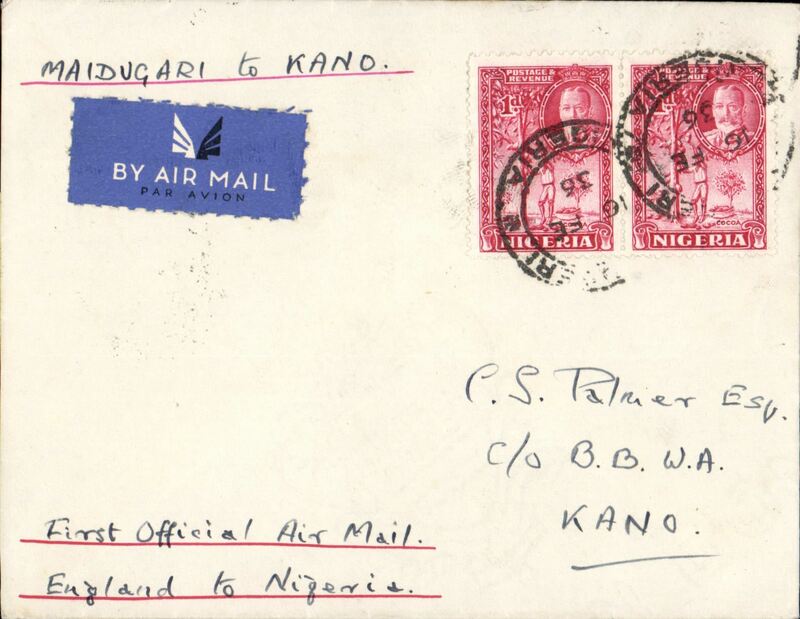 Inaugural West African Kano-Khartoum Elder Demster Feeder Service, also Imperial Airways F/F Kano to London, no arrival ds, plain cover franked 6d, ms "First Official Air Mail/Nigeria to England". 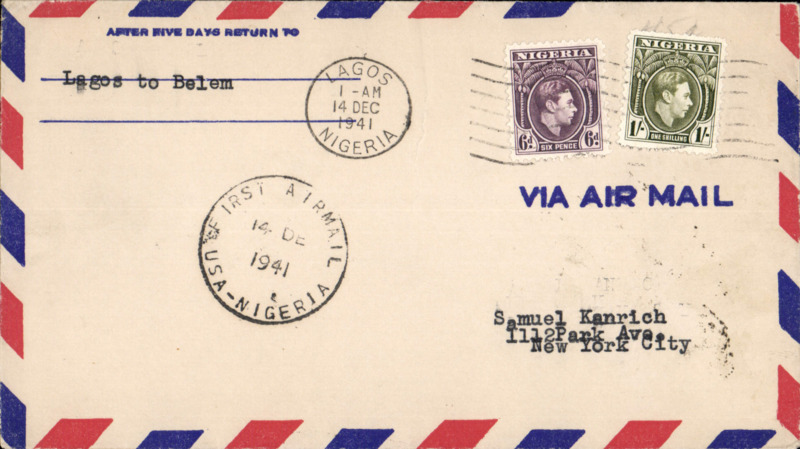 This was the first airmail service outside Nigeria. 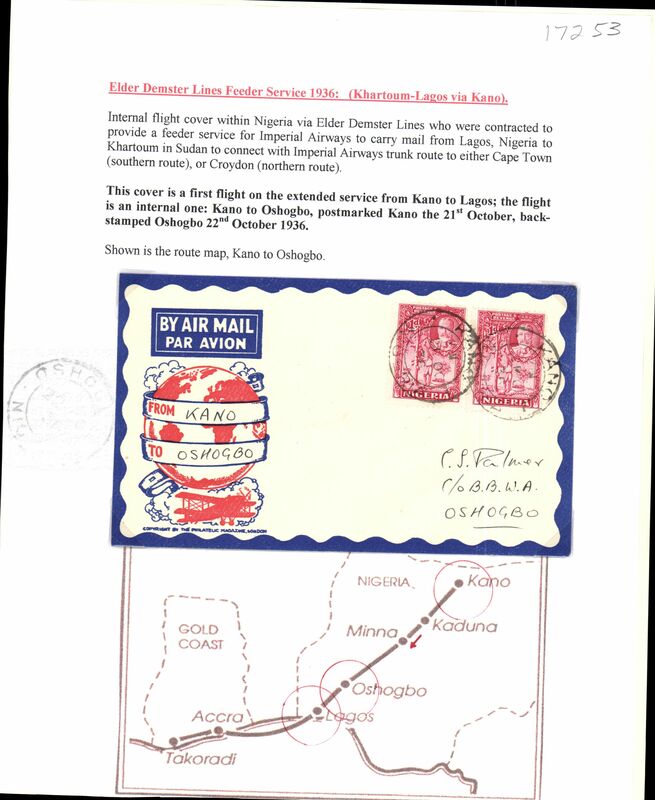 Inauguration of Elder Demster Lines, Kaduna to Lagos, bs 22/10, carried on the inaugural Khartoum-Kano-Lagos Feeder Service, attractive red/white blue Philatelic Magazine cover franked 2d. 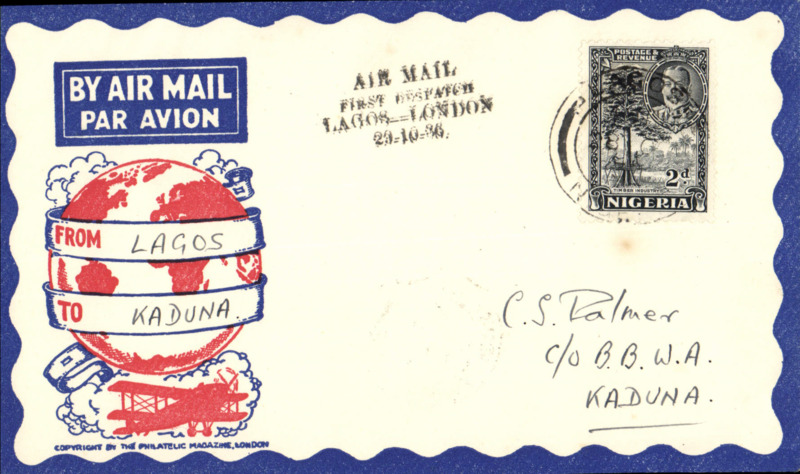 Inaugural West African Khartoum-Lagos Feeder Service, F/F Kano to Oshogbo, bs 22/10, attractive Philatelic magazine cover franked 2d, black four line "Air Mail/First Despatch/Lagos-London/29-10-36". Typed up on album page with map of route. West African Feeder Service , F/F Lagos-Kaduna, bs, attractive Philatelic magazine cover, Imperial Airways. 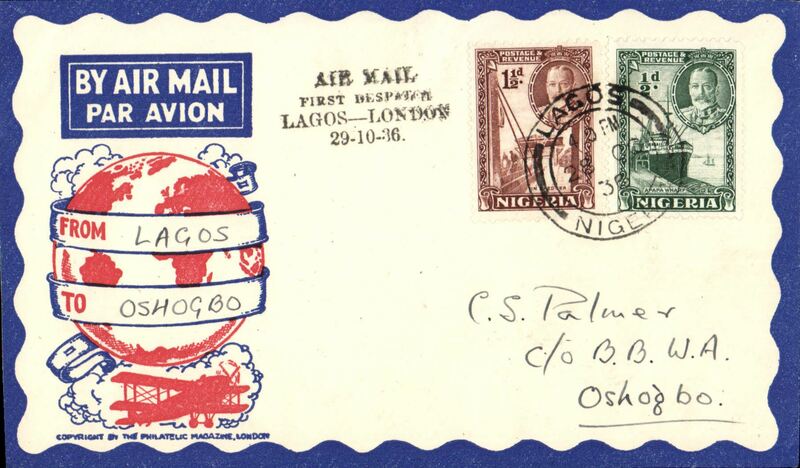 West African Feeder Service , F/F Lagos-Oshogbo, bs, attractive Philatelic magazine cover, Imperial Airways. 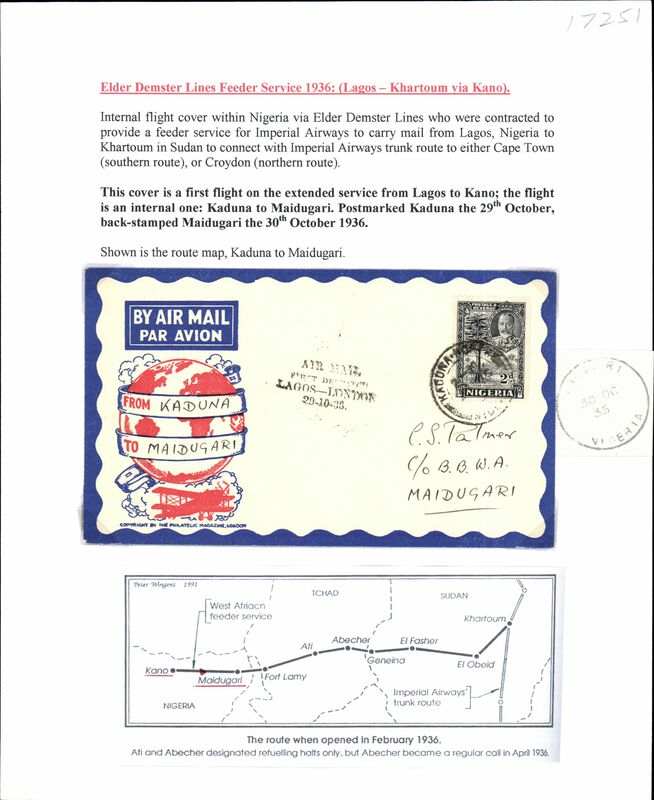 West African Feeder Service extended from Lagos, F/F Minna-Kano, bs, carried on the inaugural Kano-Lagos extension, attractive Philatelic magazine cover, Imperial Airways. 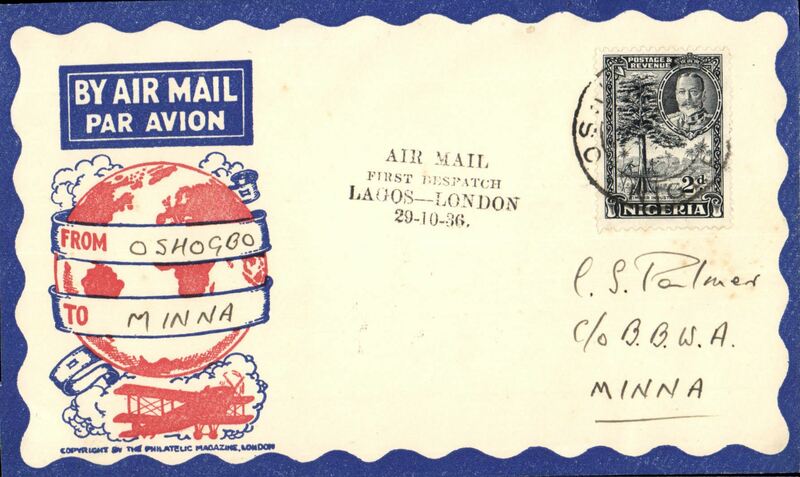 West African Feeder Service extended from Lagos, first acceptance for England from Minna, via Kano 29/10, attractive Philatelic magazine cover, Imperial Airways. 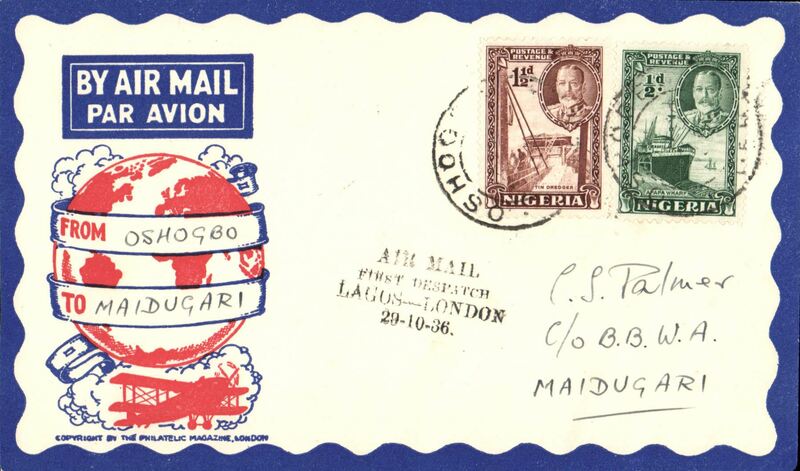 West African Feeder Service, F/F Oshogbo-Maidugari, bs, attractive Philatelic magazine cover, Imperial Airways. 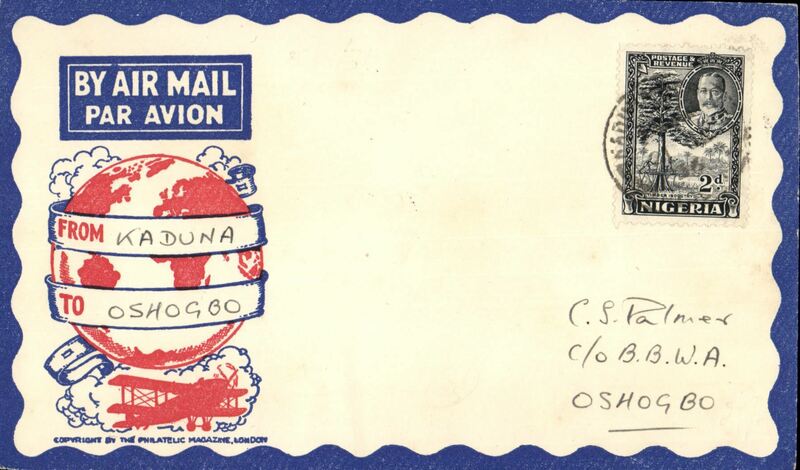 West African Feeder Service , F/F Oshogbo-Minna, bs, attractive Philatelic magazine cover, Imperial Airways. 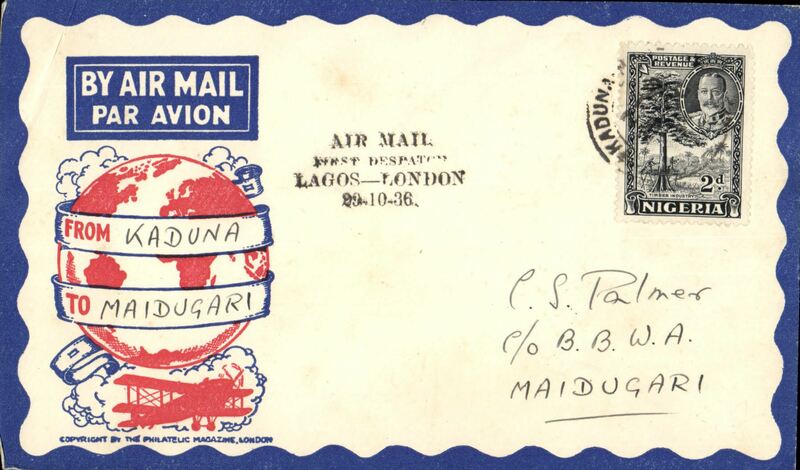 West African Feeder Service , F/F Kaduna-Maidugari, bs, attractive Philatelic magazine cover, Imperial Airways. West African Feeder Service , F/F Kaduna-Oshogbo, bs, attractive Philatelic magazine cover, Imperial Airways. 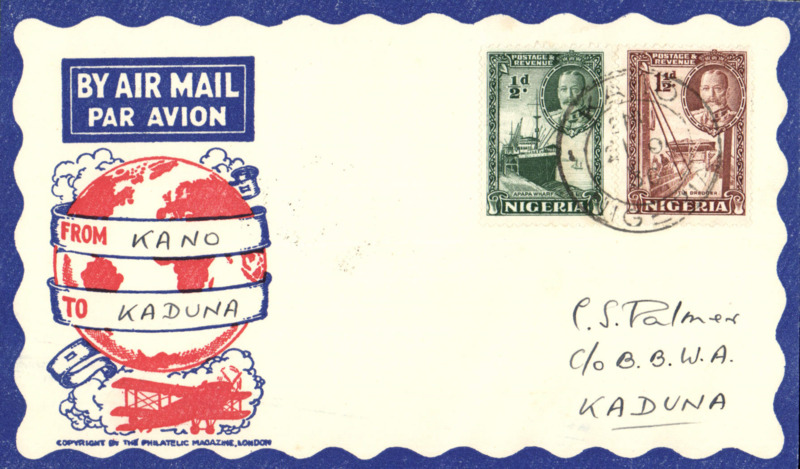 West African Feeder Service , F/F Kano-Kaduna, bs, attractive Philatelic magazine cover, Imperial Airways. 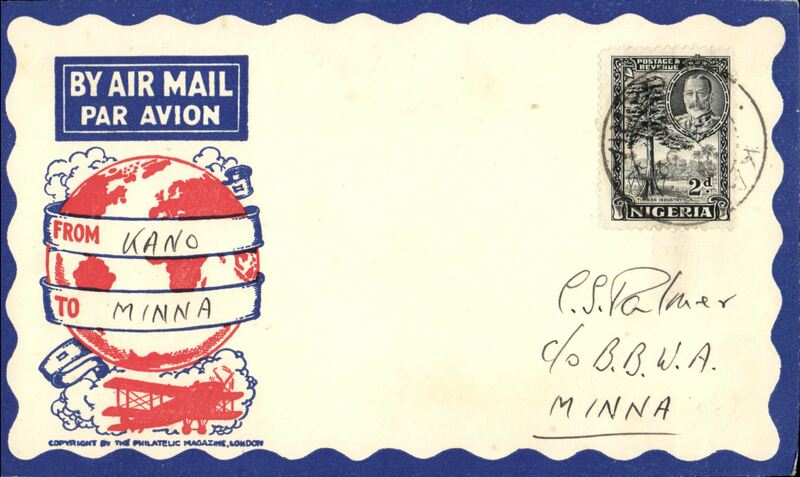 West African Feeder Service , F/F Kano-Minna, bs, attractive Philatelic magazine cover, Imperial Airways. 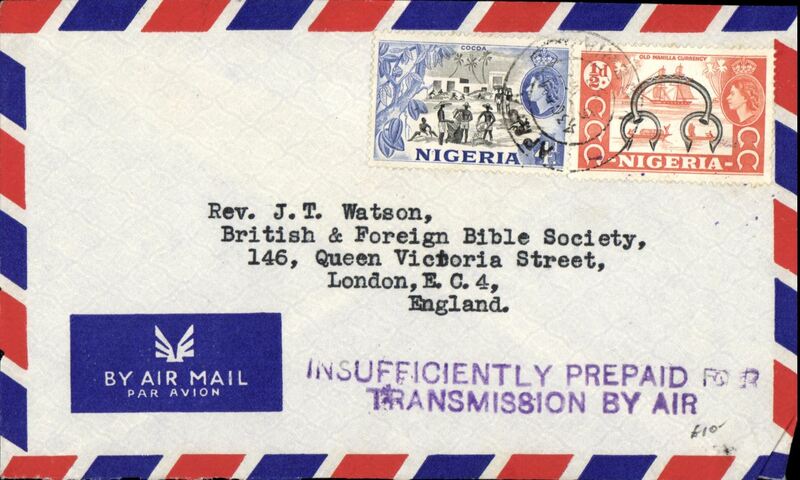 West African Feeder Service , F/F Kano-Oshogbo, bs, attractive Philatelic magazine cover, Imperial Airways. 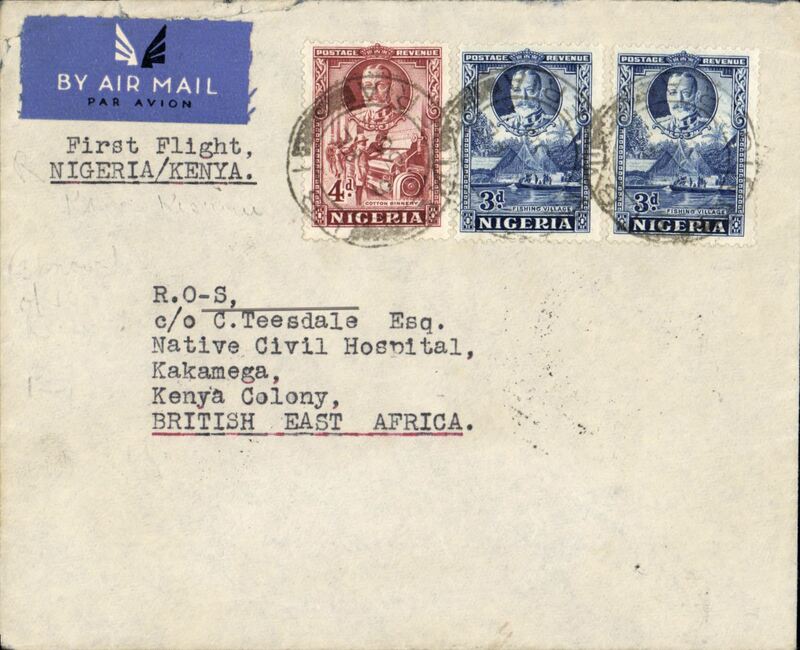 West African Feeder Service , F/F Lagos-Kano, bs, attractive Philatelic magazine cover, Imperial Airways. 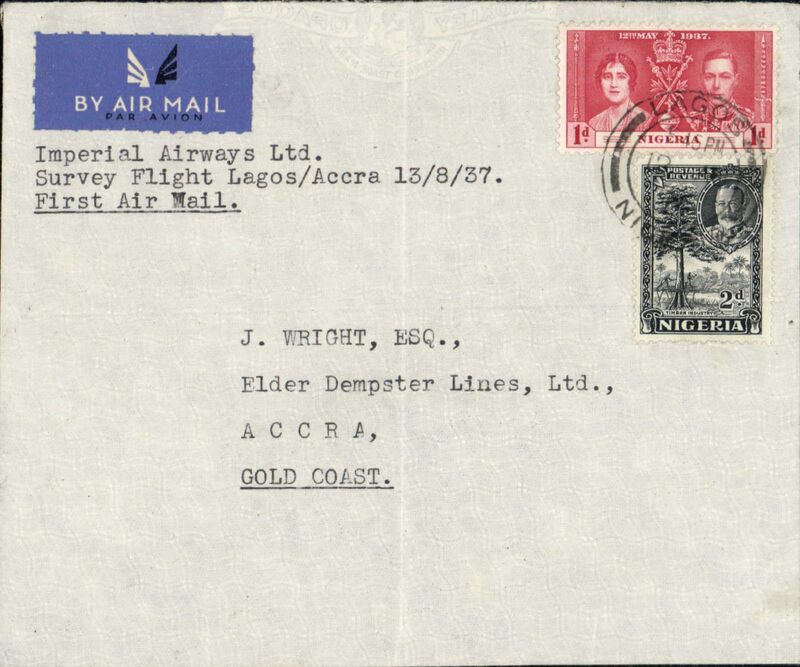 Extension of West African Feeder Service, Elders Colonial Airways/Imperial Airways F/F Lagos to London, carried on the inaugural Lagos-Kano service, plain registered (label) etiquette cover correctly rated 6d airmail, canc Lagos ds, special black "Air Mail/First Dispatch/Lagos-London/29-10-36" cachet. Violet ink used at Minna and Oshogbo, and black at Lagos. Described and illustrated in West African Airmails, The McCaig and Porter Collections, Priddy, B., West Africa Study Circle, 2002. 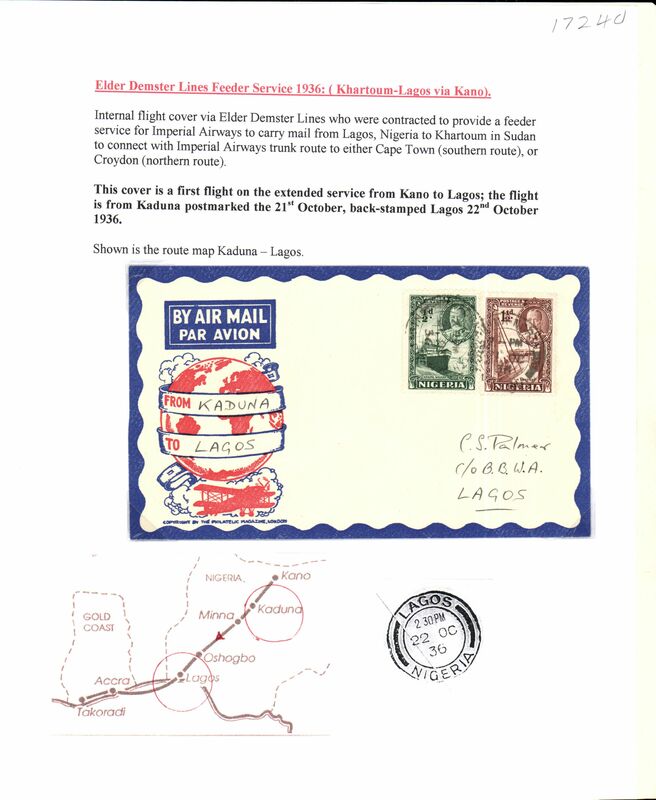 Inaugural West African Lagos-Khartoum Feeder Service, also Imperial Airways F/F Lagos to London, F/F Kaduna to Maiduguri, bs 30/10, attractive Philatelic magazine cover franked 2d, black four line "Air Mail/First Despatch/Lagos-London/29-10-36". Typed up on album page with map of route. Imperial Airways West African Feeder Service extended from Lagos, F/F Lagos to Kano, b/s, carried on the inaugural Kano-Lagos extension, black four line flight cachet, very slight blurring, see scan. 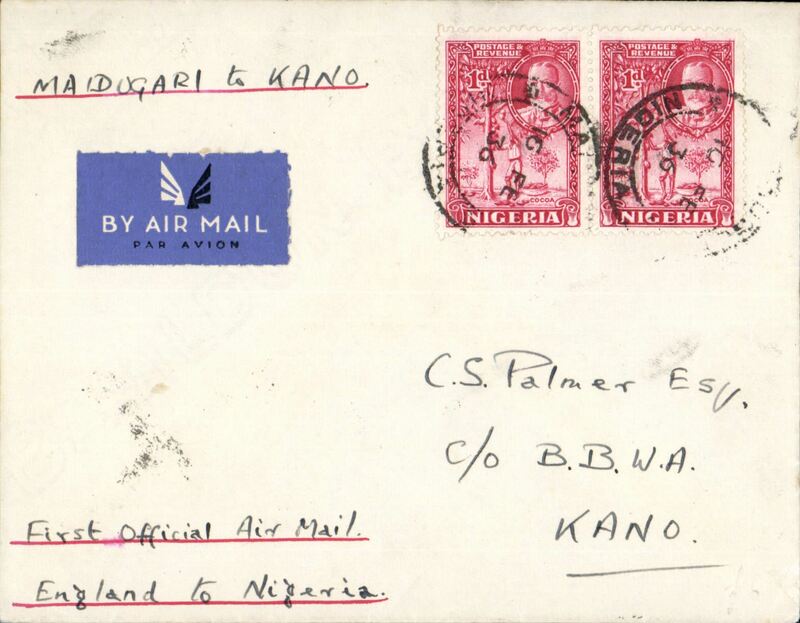 West African Feeder Service extended from Lagos, F/F Minna to London, no arrival ds, via Kano, bs 29/10, carried on the inaugural Kano-Lagos extension, attractive Philatelic magazine cover, Imperial Airways. 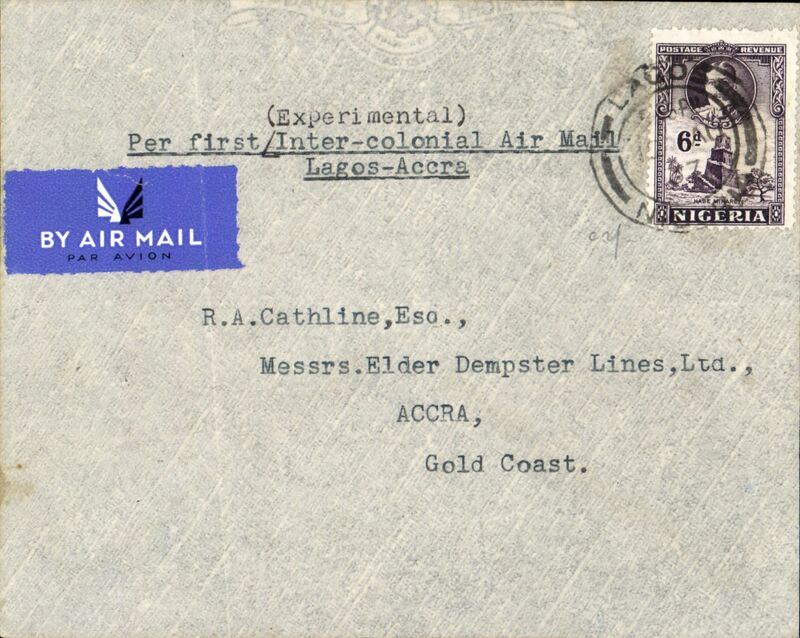 Elders Colonial Airways, experimental survey flight, Lagos to Accra, bs 13/7, pale grey airmail etiquette cover, franked 6d, canc Lagos cds, typed "First (Experimental) Inter-Colonial Air Mail/Lagos-Accra". Official mail, but the flight was not advertised, so only a small mail was carried (ref Porter). See West African Airmails, The McCaig and Porter Collections, Priddy, B., West Africa Study Circle, 2012. 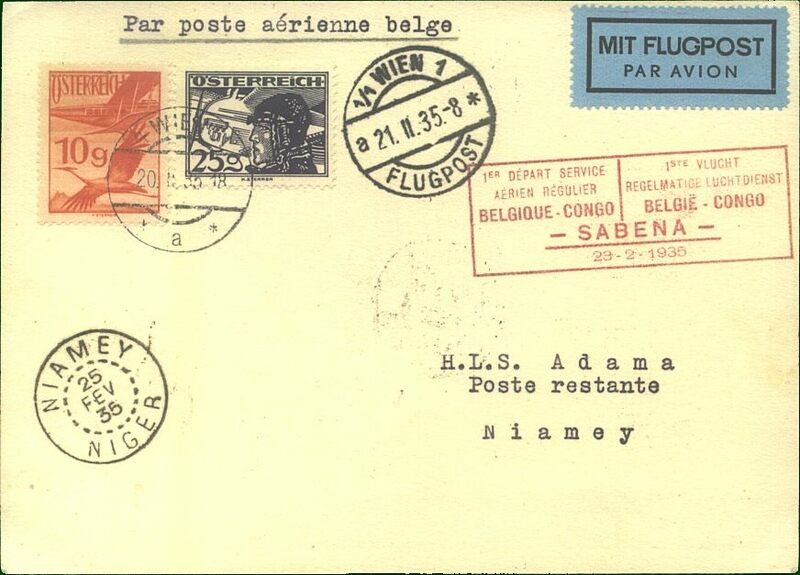 Elders Colonial Airways, experimental survey flight, Lagos to Accra, bs 13/7, pale grey airmail etiquette cover, franked 6d, canc Lagos cds, typed "First (Experimental) Inter-Colonial Air Mail/Lagos-Accra". 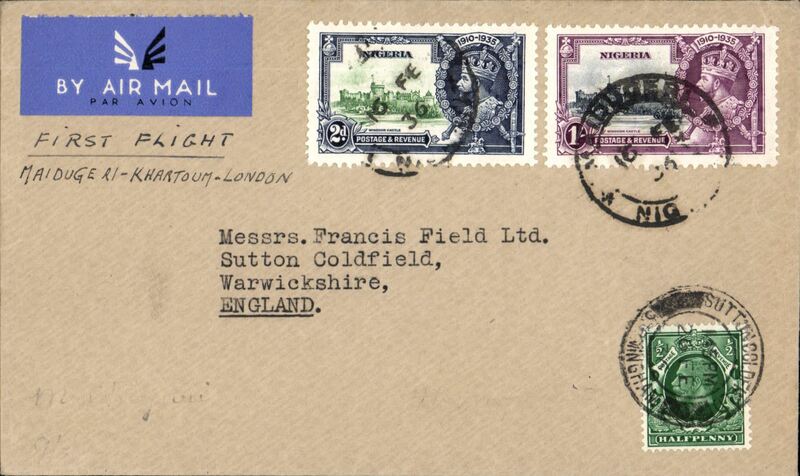 Official mail, but the flight was not advertised, so only a small mail was carried (ref Porter). Ex Colin McCaig, #780, illustrated p99,West African Airmails, The McCaig and Porter Collections, Priddy, B., West Africa Study Circle, 2002. 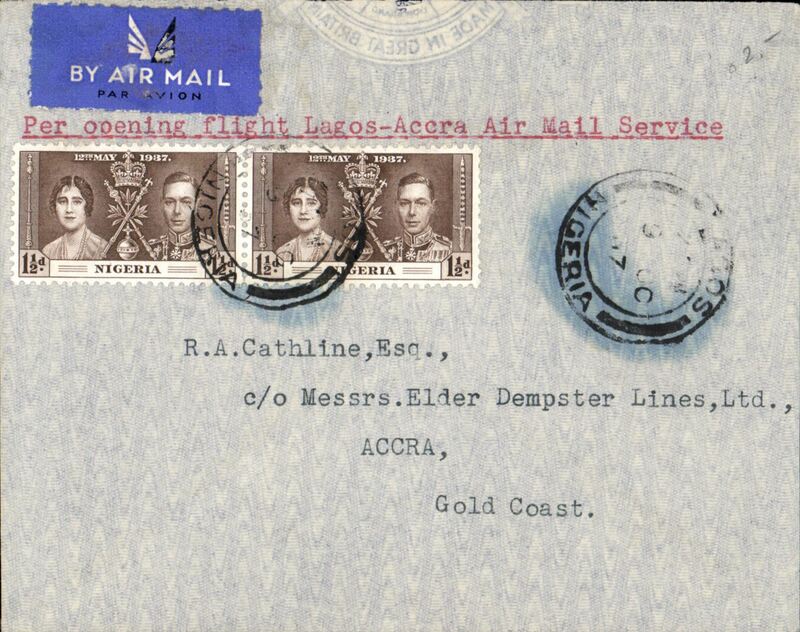 Elders Colonial Airways, first regular flight Lagos to Accra, bs 10/10, etiquette airmail cover, franked 3d, typed "Per Opening flight Lagos-Accra Air Mail Service", Francis Field authenticaton hs verso. See West African Airmails, The McCaig and Porter Collections, Priddy, B., West Africa Study Circle, 2012. Elders Colonial Airways, first regular flight Lagos to Accra, bs 10/10, etiquette airmail cover, franked 3d, typed "Per Opening flight Lagos-Accra Air Mail Service", ex Porter. 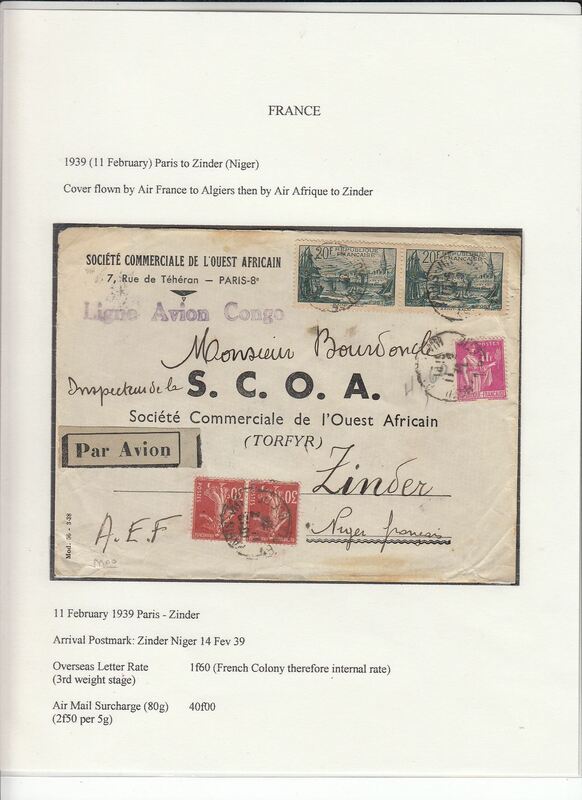 Air France/Air Afrique, 16x rated and highly franked SCOA commercial corner cover flown into Zinder, 14/2 arrival cds, from Paris, correctly rated 1F60 ordinary (French Colony therefore internal rate) and 2X 20f (1938 St Malo airmail surcharge (16 x 2F50 per 5g),uncommon violet straight line "Ligne Avion Congo" hs, pale grey/black airmail etiquette. An exhibition quality cover written up on display page with nice route, airline carrier and postage rate documentation. 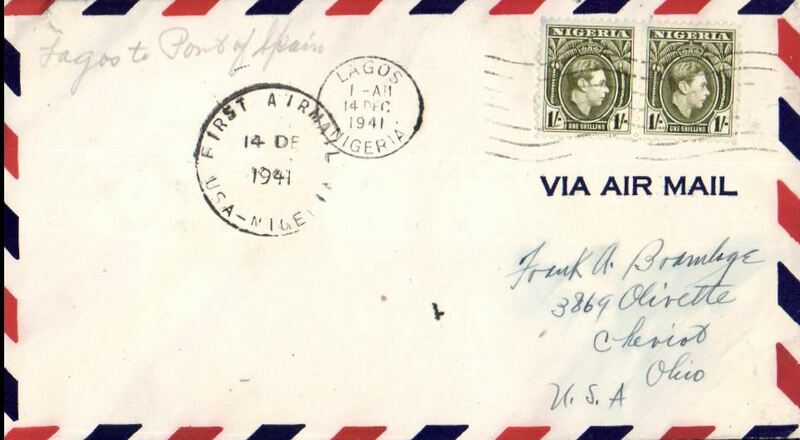 The earliest recorded inward airmail from USA to Nigeria, plain airmail etiquette cover addessed to the Holy Child Convent, Calabar, bs 11/8, franked 46cents, canc New York/Jul 29 1939/Bronx Central Annex cds, typed "Via Atlantic Clipper and European Air Mail". 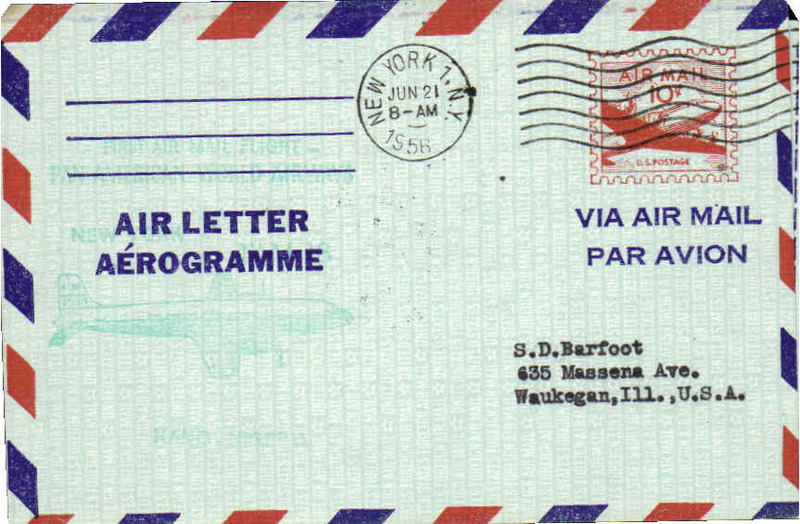 At this time there was no direct airmail service from the USA to West Africa, so mail had to be sent by Pan Am FAM18 from New York to London, then OAT by one of the services flying to WestAfrica. This cover is ex McCaig #797 and is illustrated in West African Airmails, The McCaig and Porter Collections, Priddy, B., West Africa Study Circle, 2002, p116. 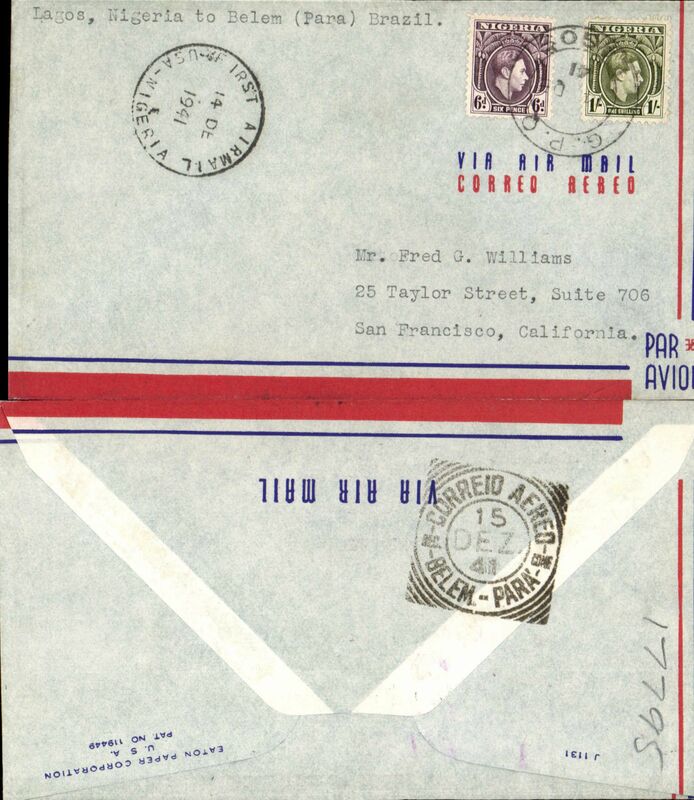 Inward censored WWII airmail from USA to Nigeria, plain airmail etiquette cover addessed to The Convent, Calabar, bs 26/12, via Kaduna 21/12, Enugu 25/12 and Aba 25/12, franked 45cents, canc New York cds, ms "Clipper/Via Portugal/to Nigeria", violet "Via Air Mail" hs, sealed black/white Nigeria censor tap, also red hexagonal Nigeria 'Passed By Censor/Nigeria/13' censor mark, great routing. Following the outbreak of war in Sep 1939 Pan Am transferred their European terminal from Marseilles to Lisbon. This cover is ex McCaig #798 and is illustrated in West African Airmails, The McCaig and Porter Collections, Priddy, B., West Africa Study Circle, 2002, p117. Early World War II censored airmail cover, Nigeria to Italy, plain envelope addressed to The Very Reverend Mother General, Convent of the Holy Child Jesus, Rome, franked 1/5d, canc Ikot Ekpene/24.1.40, arrived Rome 15/2, via Aba 24/1, Port Harcourt 26/1 and Kano 9/2, ms 'Air Mail', white/pale blue etiquette, red hexagonal Nigeria 'Passed By Censor/Nigeria/14' censor mark. 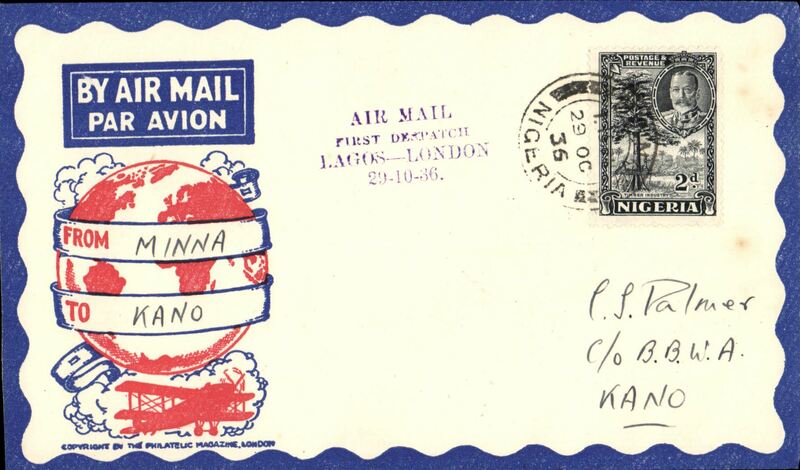 Early WWII covers flown from Nigeria to Italy are uncommon, mostly originating from missionary stations the South East of the country. Carried by BOAC to Khartoum, then Ala Littoria to Rome. However the Vichy French had suspended the BOAC route from Khartoum at the outset of the war. So this item is particularly interesting because it was flown by this route during a temporary interim, when the French governor of Chad gave permission for BOAC to refuel at Fort Lamy, and before the landplane route from Lagos to Khartoum was officially resumed in July 1940 (see Boyle p706). A super WWII item with great routing. Ex McCaig. Early WWII uncensored military aircraft crash on the Air Transport Command route carrying mails from British West African Colonies. Plain airmail etiquette cover, 5% charred, addressed to Oxford, England, no arrival marks, franked Nigeria KGVI 1/3, canc ?/?/Nigeria cds, verso Enugu/20 FE 40/Nigeria transit cds. Cachets were not applied to mails recovered on this service to ensure that no information might leak through to the enemy. Enugu is 275 miles east of Lagos. The Aeromaritime link to Lagos was not opened until April 1940, so this was most likely a British Air Transport Command flight. 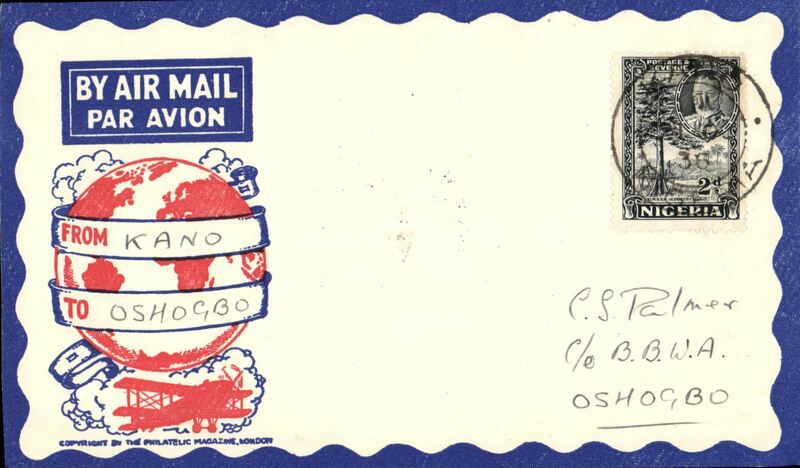 The 1/3d postage is the same as the immediate pre-war Imperial Airways Nigeria-GB rate. A scarce historical WWII item. Ex McCaig. American Air mail Service, First Flight Nigeria to England via the all air Pan Am FAM 22 West Africa-Brazil-Miami-Lagos-Bathurst service, Lagos to Bournemouth, imprint etiquette cover, correctly rated 5/- for Gold Coast-UK mail, ms "Air Mail/via USA", sealed black/white Nigeria censor tape, tied by Nigeria red pentagonal 'Censor/12 censor mark, also red Nigeria 'L/7' in triangle censor mark. Carried by Pan Am 'all the way', first E-W on the new FAM 22 service, then W-E to Lisbon on FAM 18, then BOAC/KLM to London. Crossed the Atlantic twice by air. Service discontinued in March 1942. Similar cover illustrated p131, West African Airmails, The McCaig and Porter Collections, Priddy, B., West Africa Study Circle, 2002. Part of flap has been neatly excised verso, not visible from front. Superb wartime item. F/F FAM 22, Lagos to Leopoldville, cachet, b/s, Pan Am. Image. 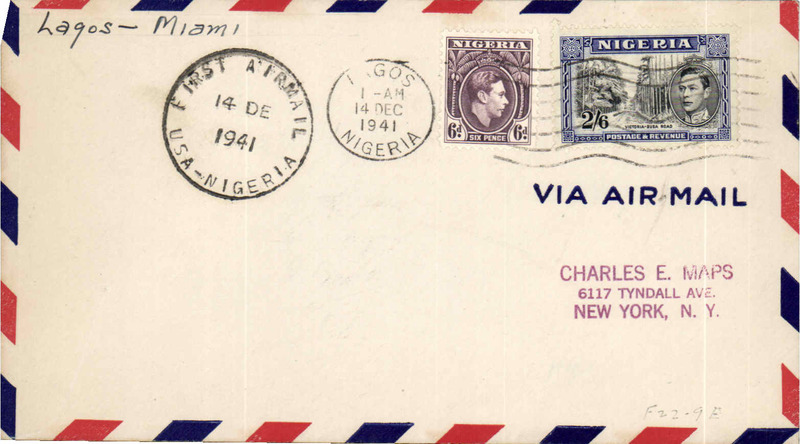 Pan Am clipper service to Africa, F/F FAM 22 Lagos to Belem bs 15/12, airmail cover franked 1/6d, 'First Airmail/USA-Nigeria' cachet, b/s. This strategically important service, linking Africa and the USA, opened just at the critical time when Japan attacked Pearl Harbour and the USA went to war. Image. 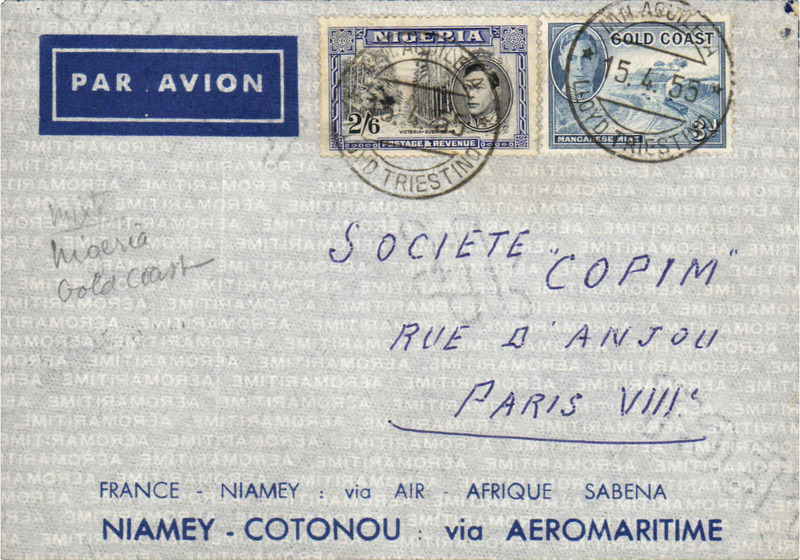 Pan Am clipper service to Africa, F/F FAM 22 Lagos to Bathurst, b/s, plain cover franked 1/-,6d, 'First Airmail/USA-Nigeria' cachet. This srategically important service, linking Africa and the USA, opened just at the critical time when Japan attacked Pearl Harbour and the USA went to war. American Air mail Service, F/F Nigeria to England via the all air Pan Am FAM 22 West Africa-Brazil-Miami-Lagos-Bathurst service, Lagos to Bournemouth, airmail etiquette cover, correctly rated 5/- for Gold Coast-UK mail, ms "Air Mail/per Pan American Airways", sealed black/white Nigeria censor tape, tied by Nigeria red pentagonal 'Censor/12 censor mark, also red Nigeria 'L/3' in triangle censor mark. Carried by Pan Am 'all the way', first E-W on the new FAM 22 service, then W-E to Lisbon on FAM 18, then BOAC/KLM to London. Crossed the Atlantic twice by air. Service discontinued in March 1942. Ex McCaig #812, illustrated p131, West African Airmails, The McCaig and Porter Collections, Priddy, B., West Africa Study Circle, 2002. Superb wartime item. Some rough opening along top edge verso, not visible from front. 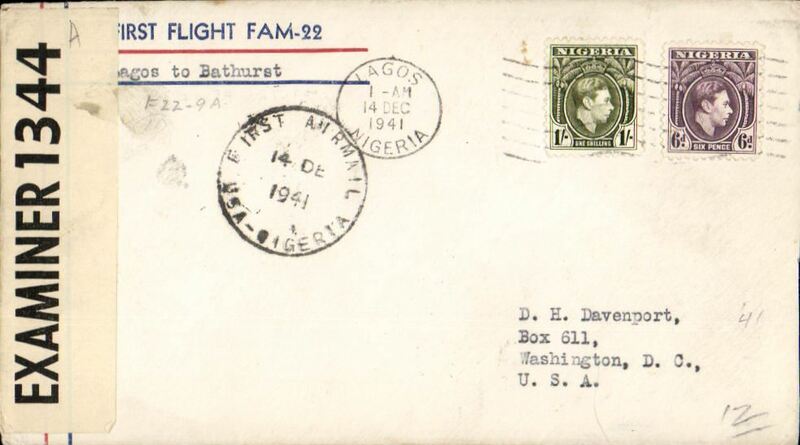 F/F Lagos to Bathurst, bs 2/2, carried across the Atlantic twice by Pan Am FAM 18/22 South Atlantic Service, censored WWII cover, franked 1/6d, special black circular 'First Airmail/14 Dec 1941/USA-Nigeria' flight cachet, sealed B&W PC90 Carribean censor tape. The plane left Lagos on 14/12 as planned, but plane stopped at Fishermans Lake instead of Bathurst, so mail which should have been dropped there was carried on to Natal and returned on the next eastward flight arriving at Bathurst on Feb 2nd, 1942. The stop at Bathurst was temporary, as it was only 150km from Dakar which was under the control of Vichy France. The intention was for it to be replaced by a base at Fisherman's Lake 55km W of Monravia. 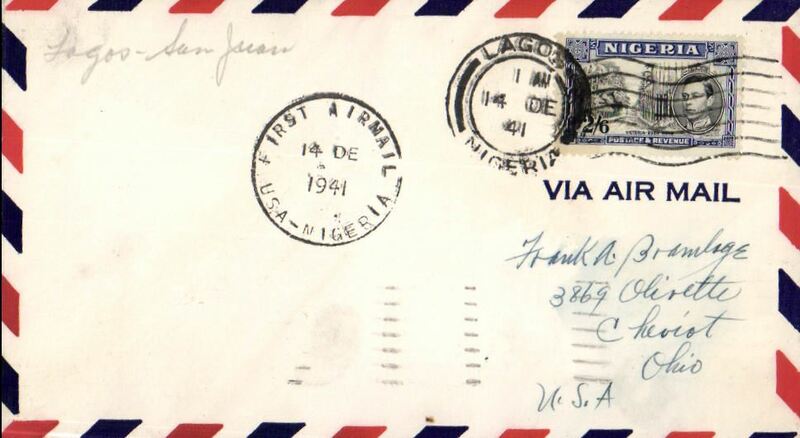 Interesting WWII item..
Pan Am clipper service to Africa, F/F FAM 22 Lagos to San Juan, airmail cover franked 2/6d, 'First Airmail/USA-Nigeria' cachet, b/s. This strategically important service, linking Africa and the USA, opened just at the critical time when Japan attacked Pearl Harbour and the USA went to war. 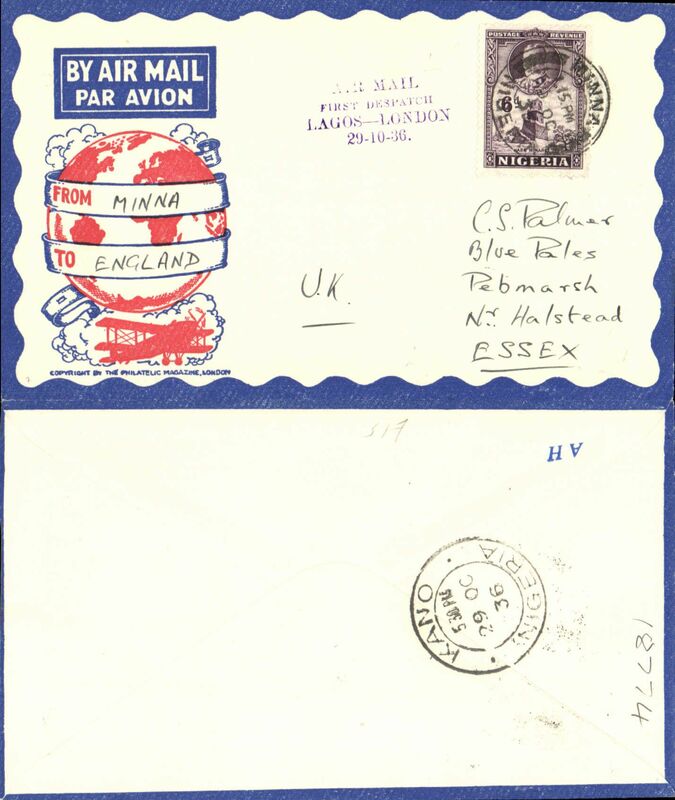 Pan Am clipper service to Africa, F/F FAM 22 Lagos to Port of Spain, plain cover franked 1/- x2, 'First Airmail/USA-Nigeria' cachet, b/s. This srategically important service, linking Africa and the USA, opened just at the critical time when Japan attacked Pearl Harbour and the USA went to war. 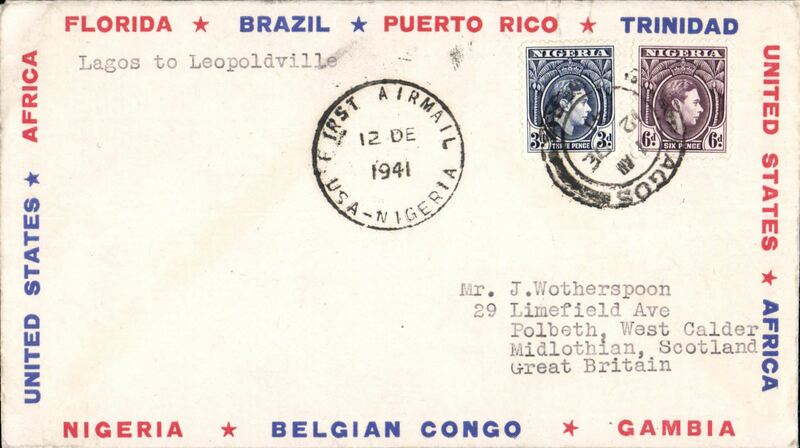 Pan Am clipper service to Africa, F/F FAM 22 Lagos to Belem, airmail cover franked 1/-,6d, 'First Airmail/USA-Nigeria' cachet, b/s. This strategically important service, linking Africa and the USA, opened just at the critical time when Japan attacked Pearl Harbour and the USA went to war. WWII censored military aircraft crash on the Air Transport Command route carrying mails from British West African Colonies. 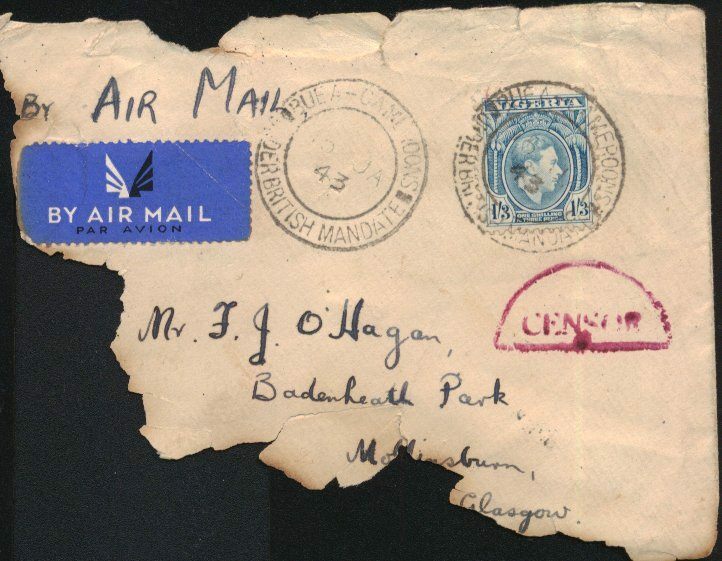 Plain airmail etiquette cover, 35% charred, addressed to Glasgow, no arrival marks, franked Nigeria KGVI 1/3, canc "Buea-Cameroons/16 Jan 43/Under British Mandate", ms "By Air Mail", red Nigeria half circle censor mark. Cachets were not applied to mails recovered on this service to ensure that no information might leak through to the enemy. Unlisted in Nierinck, but a letter from Francis Field, dated 7/7/52, accompanies this lot. It guarantees this cover to be "a genuine accident mail souvenir which was was involved in an RAF plane crash over North Africa when most of the mail was burned beyond recognition". This cover is ex McCaig and is illustrated in West African Airmails, The McCaig and Porter Collections, Priddy, B., West Africa Study Circle, 2002, pp 154,155. A truly rare and historical WWII item. Aeromaritime Resumed Service, inward to Lagos from Konkary, bs 25/5, blue/white imprint etiquette cover franked 4.50 & 1.90 Fr Guinea air samps, canc Konkary cds, black boxed "Un Seul/But/La Victoire" slogan cachet used specially on this service. Due to wartime conditions Aeromaritime had been forced to curtail, or even discontinue, certain services. However, in 1943, as conditions became more stable, and in West Africa in particular, it was decided to reopen certain previous routes. One of these was the French Guinea-Nigeria service. This cover is ex McCaig #818, and is described and illustrated in West African Airmails, The McCaig and Porter Collections, Priddy, B., West Africa Study Circle, 2002, p137. Superb wartime item. Scarce Reseau Aerian Militaire Francaise (R.A.M.F. 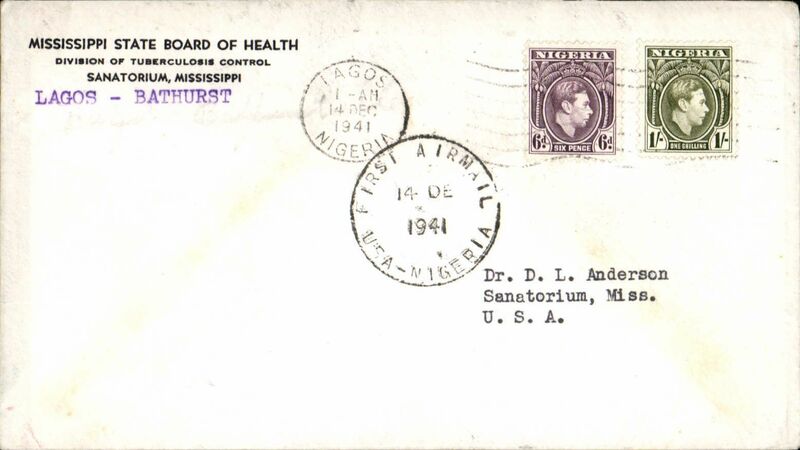 ), commercial censored WWII airmail cover from the Amusu Industrial Works Sevice, Lagos to Porter Bros, Liverpool, no arrival ds, correctly rated 1/3d, airmail etiquette, faint partial strike Nigeria octagonal "Crown/Passed/PP" censor mark. There are no other marks to confirm arrival date or route, probably for security reasons. On 3/8/43 R.A.M.F. inaugurated a service between Gao (French Sudan) and Nigeria and in 1944 was flying a regular service between Nigeria and Dakar. Mail for OAT to England was transferred to other servces at Zinder or Dakar. Very little mail has been recorded on this service. Ex Porter. Stefensson Missionary Flight, Lagos to Stockholm, 17/3 arrival ds on front, registered (label) buff cover franked 1/11d, canc Lagos cds, red three line flight "Scandinavian Missionary Flight/First Trip/Permier Vol/Forsta Tur/Stockholm-Leopoldville-Stockholm" cachet, violet "from Lagos Mar 14th" and "Air Mail" hs's, registered (label) cover. The route was Stockholm-Malmo-Brussels-Marseilles-Algiers-El Colea-Auleb-Gao-Lags-Liberville. A hand drawn map of the route accompanies this item. 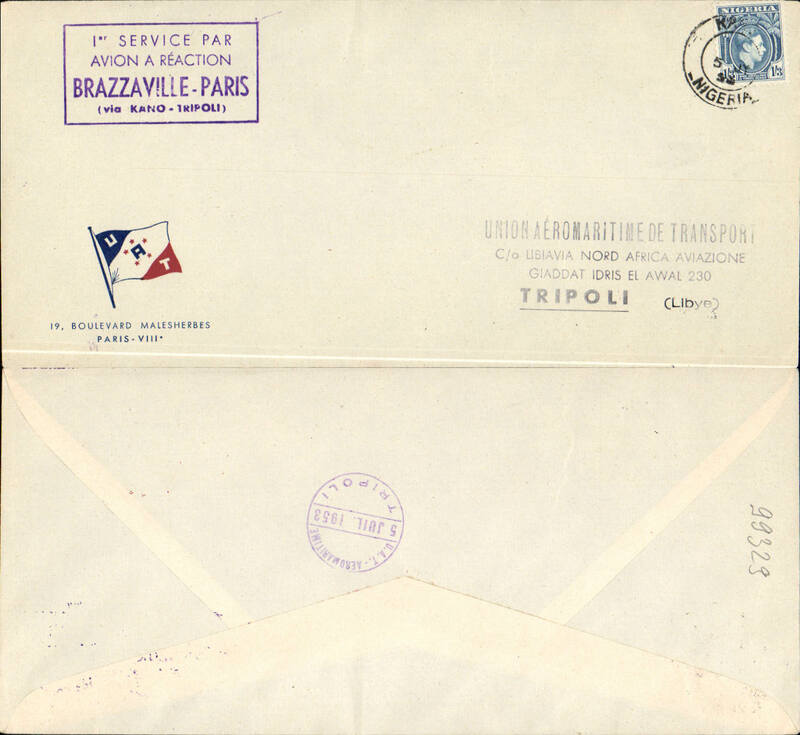 UAT Aeromaritime, F/F Comet 1, Kano to Brazzavile, bs 4/7, fine strike violet boxed Paris-Brazzaville (via Tripoli-Kano) flight cachet, red/white/blue UAT company cover with flag logo in lower left hand corner, franked 1/9d. 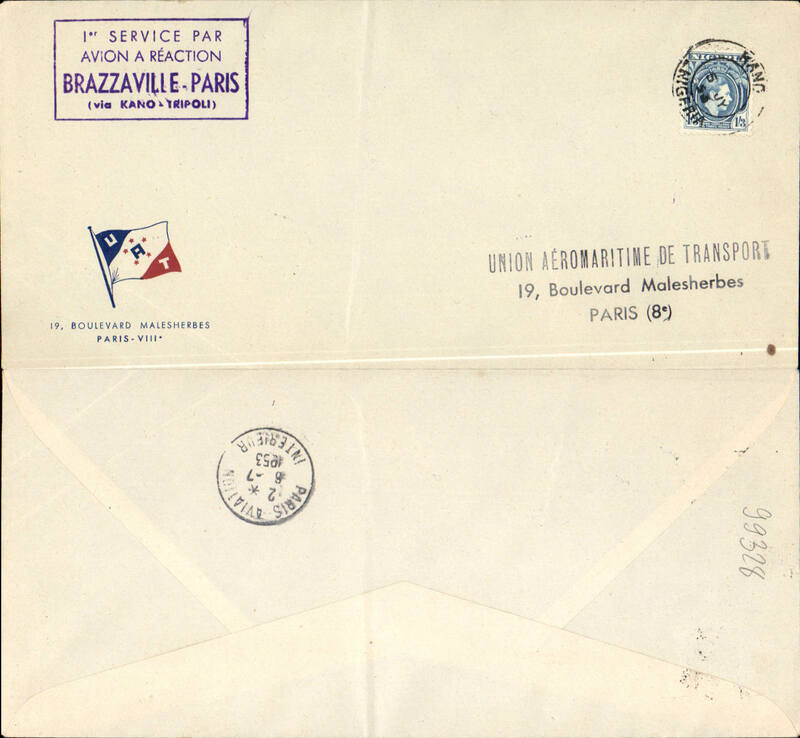 UAT Aeromaritime, F/F Comet 1, Kano to Paris, bs 6/7, fine strike violet boxed Brazzavile-Paris (via Kano-Tripoli) flight cachet, red/white/blue UATcompany cover with flag logo in lower lh corner, franked 1/3d. UAT Aeromaritime, F/F Comet 1, Kano to Tripoli, bs 5/7Paris, fine strike violet boxed Brazzavile-Paris (via Kano-Tripoli) flight cachet, red/white/blue UATcompany cover with flag logo in lower lh corner, franked 1/3d..
Air Afrique/Sabena printed company airmail cover, mixed franking Nigeria 2/6d & Gold Coast 3d, canc Minaquilah/Lloyd Trieste, posted on board Lloyd Triestino vessel to Paris. Unusual. 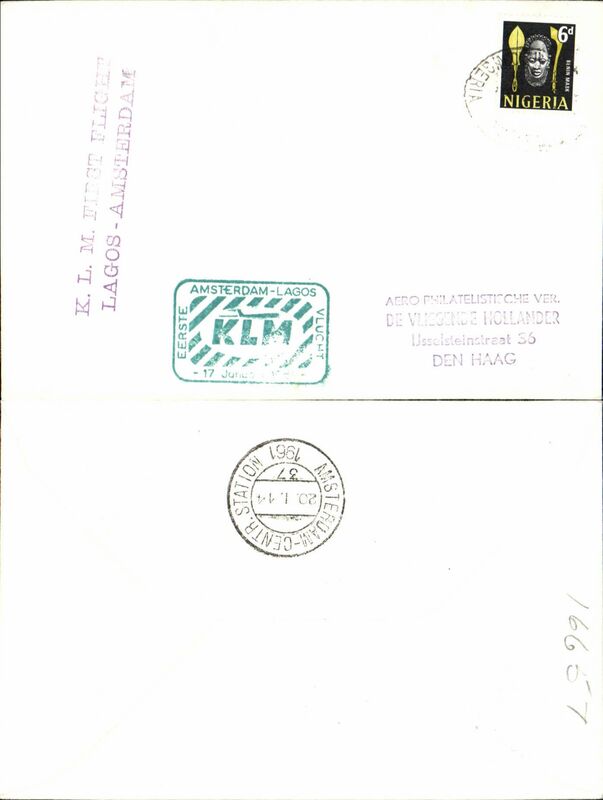 Lagos to London, airmail cover franked 4 1/2d, fine strike violet two line hs "Insufficiently Prepaid For/Transmission By Air"
KLM 1st flight Lagos-Amsterdam, franked 6d, violet two line 'Lagos-Amsterdam' and boxed green 'Amsterdam-Lagos' flight cachets.